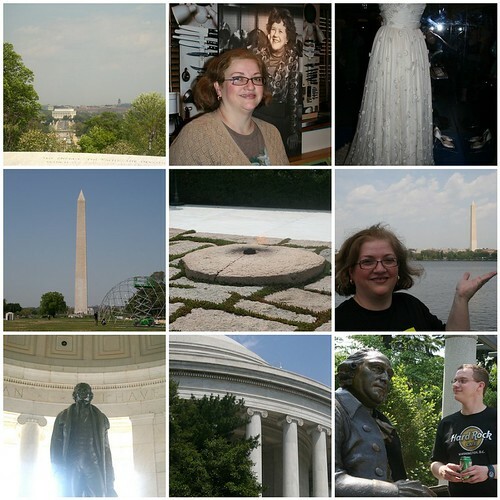 We had a whirlwind of a trip to Washington, DC from April 14-16th (the 14th was our 26th anniversary). Sean has been attending the AAG (geography) meetings now for two years. Last year, while still a senior at PSU, he went to Las Vegas, but with a handful of pals. This year he asked us to go along as it was a driving trip and since we haven’t been down for over 10 yrs, we agreed as it probably would be fun! The trip down was faster than coming home. We had to stop for a quick lunch (why Mc*Ds?) and then we headed to where the conference was so Sean could register. It was a nice Marr*iott with funky garage parking. It only took Sean a few minutes to register and we hopped back in the car to find out it was $17 to park in the garage from get this, 0-2 hours. What a rip off! We should have gone to where we were staying, took the shuttle to Union Station, and then the metro to the Marr*iott. That’s what Sean ended up doing a few times the next day anyway. We stayed in a fairly new Holiday*Inn Express, but we had to take the above mode of transportation to get around. And they charged $14 a day to park there. Wednesday night we did get a free pasta dinner at the HIE-it was a catered one. Not bad for free. We headed to Union Station that evening to look around and see where the metro was. It’s a fabulous place with restaurants in every corner of the main area and shops in the other areas. I ended up buying a neat t-shirt with some of the founding fathers in silhouettes wearing ipods. Thursday was the busiest day and I don’t know how I did the walking I did after being sick and laid up a bit. Sean went to the conference and Bri and me headed to Smithsonian/mall area. We decided to venture to the American History museum (my favorite) and saw Julia Child’s kitchen (fairly new and shown in the movie Julia and Julie) and Michelle Obama’s Inaugural gown. She’s really tall! Her jewelry and Jimmy*Choo shoes were also next to the dress. We also say Carol Burnett’s ‘Gone With the Wind’ curtain dress-so funny! I have photos of all the above. After the American History, I wanted to see the Holocaust museum, which was down and across the street. That was fairly crowded with groups of kids. We saw the German/Hitler propaganda exhibit (definitely brain washing). We also saw an exhibit about a German boy named Daniel who was a Jew who went from living in a nice home to a concentration camp-very moving. When we caught up with Sean, I was starting to get very fatigued. We took the metro to where Ford’s Theater and the Hard Rock Cafe are (10th St). We did get inside the Hard Rock (4th one we have visited now), but could not get in the theater as it was the anniversary of Lincoln’s death and there was about 200 people waiting to get inside. We went in a few touristy shops and I got my mom a glass prism with ‘holograms’ of the sights (she loved it). When we got to Union Station, we decided to get our anniversary dinner there at a place called ‘America’. Sean parted ways as he had a reception to attend and got his free dinner at the hotel. He also met up with a friend who lives in Virginia now. The dinner was great (I had salmon and Brian had steak). The waiter even brought us a sliver of fudge cake with my key lime pie because he knew it had been our anniversary. Very nice. The last day was equally as hectic! 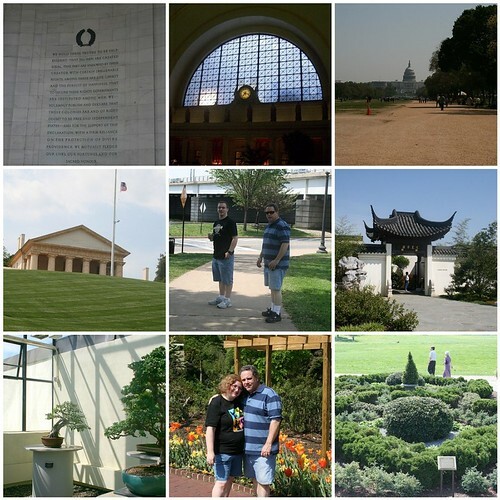 We checked out early and went to the National Arboretum. You know I had to see that place. It had some lovely areas, especially the bonsai. It was approaching 80, so a bit warm. They have a serious carpenter bee problem and the males were swarming all over the place! After we walked around there, Sean wanted to see the Jefferson Memorial. The GPS was leading us in the right direction, but we couldn’t figure out where to park. We finally did and had quite a walk to the Memorial. Sean was impressed and was glad we found it. We then decided to go to Arlington Cemetery to view just the Kennedy graves. We had trouble with the GPS again. We went there with no lunch, just some snack foods to hold us over. It’s a hilly place and I was tired when we got up to the Kennedys. The guys decided to see the Tomb of the Unknowns and I found a bench and waited…and waited. It was windy and both me and the lady next to me sneezed. I caught up to the guys heading down another path to the visitor center and used the ladies’ room. When I came out of the bathroom, I got the worst tickling feeling in my throat and started to cough and wheeze for about 45 seconds to a minute. That’s all I needed was to pass out at a cemetery! I figured I had exercise induced ‘asthma like’ symptoms. But I had just sneezed and maybe that brought something up enough to constrict my lungs for a minute. No inhaler. Very scary! It hasn’t happened since. Knock wood. We left Washington then and got stuck in the Friday traffic heading out of town. We ended up not eating a square meal until close to 6 when we stopped in a small Maryland town. We got home about 7:30 that night. Glad to be home! I like seeing different things, but I’m definitely a country girl through and through. It sounds like a fun trip. I wish I lived close enough to scoot over there for a weekend!